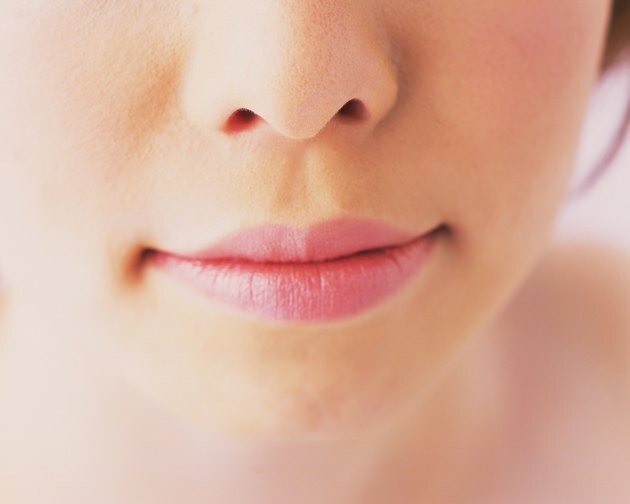 Itchy nose skin is commonly caused by xerosis, more commonly known simply as dry skin, according to the CNN Health website. Although an itchy nose isn’t usually serious, it can be uncomfortable and frustrating. Nonprescription and prescription treatments can assist in minimizing irritation. Lifestyle changes can also help to prevent and relieve itching. There are several causes of itchy nose skin. Dry skin may be caused by weather changes and humidity level changes, according to CNN Health. Living in a desert region where temperatures are high and humidity is low may also cause itchy and dry nose skin. Sun exposure can dry out the skin, causing irritation. Ultraviolet rays penetrate deep into the skin, causing collagen and elastin fibers to break down fast. This can cause irritation and damage to the skin. Itchy nose skin can be treated with a nonprescription cream that contains lactic acid or urea, according to the CNN Health website. This is typically available at your local drugstore. Hydrocortisone lotions can also be used to reduce inflammation. If the skin on your nose doesn’t respond to over-the-counter treatments, contact your doctor. She can prescribe prescription-strength treatments to minimize irritation. Wear sunscreen when going outdoors, even on cloudy days. Burning of the skin may cause itching, peeling and dryness. Also taking hot showers and baths can break down the skin's protective barriers and cause itchiness. Frequent swimming in chlorine pools can also cause itchiness, according to CNN Health. Harsh facial soaps strip oils from the nose area. Use a gentle soap and apply an oil-based moisturizer to sooth itchy dry nose skin, recommends CNN Health. Some people think using stronger soaps will help slough off flaky skin and relieve itchiness. However, according to CNN Health, you should use gentle cleansers,and use warm, not hot, water. Limit time shower time to 15 minutes or less. Gently pat your skin dry with a towel. Talk with your doctor about itchy nose skin. Some medical conditions, such as thyroid disorders, may cause increased activity in the sweat glands or increased dryness. Either may cause rough, dry skin. Also, avoid scratching your nose. This can cause your skin to crack and become infected.